The Government released their much hyped response to our booze culture yesterday when Simon Power released his ‘blame it all on the bloody kids alcohol policy’, that’s right folks, apparently it’s all the bloody kids fault. National have spent so much political capital building up the nanny state politically correct monster that they now can’t implement any real social policy for fear of waking it in the minds of their dumb redneck supporters, hence this watered down, piss weak response to our Nation’s booze binge culture. The mantra from National is ‘it’s all the kids fault, it’s all the kids fault, it’s all the kids fault’ when Research found that 92 per cent of New Zealand's heavy drinkers were 20 years and over, and 70 per cent were 25 and over. 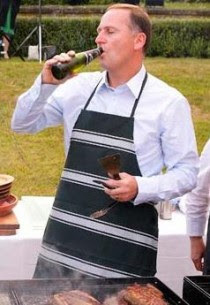 John Key has been doing the heavy petting circuit that passes as mainstream media interviews in this country telling all who will listen that alcohol in moderation is effectively healthy goodness in a glass and why should he and his drinking buddies suffer because of dem bloody kids. If we wanted to do something serious about our booze culture, we would ban booze from supermarkets where it is a loss leading product, we would increase the price and we would lower our blood alcohol level to stop NZers from legally driving drunk, but that would be considered too Nanny state Politically correct, so lets just blame the bloody kids. What a cop out, what a waste of time, how very John Key. As it will not be illegal to supply alcohol to 18 & 19 year olds, sit outside your local liquor outlet on a fri/sat evening. Have a sign advertising your intentions or just talk to the young people as they arrive/pass by. Check their ID to make sure they are 18 or 19. Ask what their beverage of choice is. Accept a donation around the size of the cost of said beverage, plus some commission (maybe you are busking etc). As a token of appreciation, gift the generous donor with his choice of beverage. Is there a good reason why the only substance we are allowed to consume is the one that makes us all ugly stupid and violent? Is it because ugly stupid violent people are exactly who the National party is relying on to get themselves re-elected? Is that why NZ women have also been encouraged to join in on the ugly stupid violent drinking culture? Just so they end up voting National? We are nothing but a bunch of mindless violent pisshead fuckwits pretending to be a civilised society.